ISTANBUL (Reuters) - The lira weakened against the dollar on Tuesday after U.S. President Donald Trump said he would give Turkey no concessions in return for the release of a detained American pastor, the latest salvo in a worsening rift between the NATO allies. Trump said that, after he helped persuade Israel to free a detained Turkish citizen, he thought Turkish President Tayyip Erdogan would then release Brunson. The lira weakened to 6.0925 against the U.S. currency by 1111 GMT, from a close of 6.0865 on Monday, when Turkish markets began a holiday to mark the Muslim Eid al-Adha festival that continues for the rest of this week. Trade was thinner than usual and probably mainly offshore, with local markets closed for the holiday. The currency has lost 40 percent of its value against the dollar this year. However, selling on Tuesday was limited due to a broadly weaker dollar. Turkish government officials did not comment on Trump's remarks when they spoke after prayers to mark the start of the festival. Devlet Bahceli, leader of a nationalist party allied with Erdogan's AK Party, told reporters: "We have no business with those who love Brunson more than us". Erdogan, who had been expected to speak to reporters after morning prayers, made no public statement. He has repeatedly cast the currency crisis as an attack on Turkey but has stopped short of singling out any one country. He prayed on Tuesday morning at a mosque near the tourist resort of Marmaris on the south coast and then handed out gifts to local children, the Milliyet newspaper reported. He also spoke by phone to soldiers stationed near the border with Iraq, sending them greetings for Eid al-Adha. "I believe that as long as you stand tall our flag will not fall, our call to prayer will not fall silent and this homeland of ours will not be divided," the Hurriyet newspaper reported him as saying. On Monday he appealed to Turks' religious and patriotic feelings ahead of the Muslim holiday, promising they would not be brought "to their knees" by the economic crisis. A Turkish court last week rejected Brunson's appeal for release, drawing a stiff rebuke from Trump. The U.S. president - who counts evangelical Christians among his core supporters - has said he would double previously announced tariffs on Turkish steel and aluminum imports. 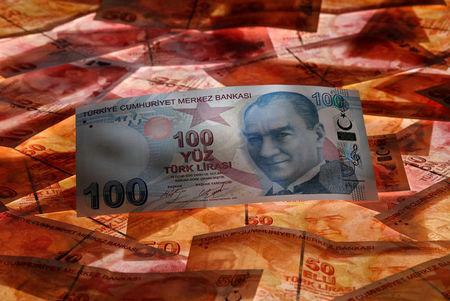 Separately, ratings agency Fitch said on Tuesday that tight liquidity amplified risks for Turkish companies. Another ratings agency, DBRS, said European banks with Turkey exposure face a manageable capital impact. Underlining the increased diplomatic tensions between Turkey and the United States, the U.S. Embassy in Ankara came under gunfire on Monday. Nobody was injured and Turkish authorities later detained two men over the incident.